A hydroponics system and grow room are the first step in setting up for indoor plant cultivation; the next thing to look into is plant nutrients and additives. There are literally hundreds of options here and it can get very confusing, and we sell all of them. However, some are definitely better than others. Plants will grow with basic nutrients - you will need something high in nitrogen when in the vegetative stage and something high in phosphorous and potassium when in the flowering stage. Micro nutrients and trace elements such as magnesium and calcium and a host of others must also be available for healthy growth. When growing in soil, a lot of these nutrients are naturally available, but when growing in a sterile medium like rockwool or clay, as is done in the majority of hydroponics systems, we must add everything the plant needs via nutrient solution. We must also accurately maintain the pH level of the solution as it is delivered to the plants because different nutrients are more available to the plants than others at different pH levels. We have found that a pH of 6.0 to 6.5 works well for clay pebbles and 5.5 to 6.0 works best for rockwool. 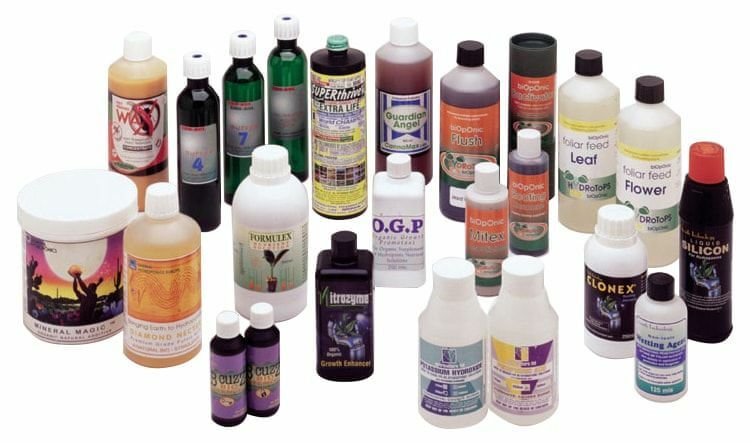 And when it comes to choosing which nutrients and additives to purchase, we do recommend some over others, and you don’t necessarily have to chose one brand and stick with them across the board; you can mix and match different things from different brands to suit different stages of growth. We believe when trying to get the best performance and yield possible with hydroponics, it is best to use very small amounts of a whole array of different nutrients and additives to create an alchemical soup for your plants to be able to access whatever they need when they need it. We do have our own custom schedule which we designed employing the very best nutrients to use from seed to harvest for the advanced growers, and if you want to keep it simple, we can advise you on this as well. Just give us a call! Do not follow the schedules of the nutrient manufacturers, 9 times out of 10 they recommend way too high a dose, and never follow the dosages on the bottles. In hydroponics, less is more - always go half strength if in doubt and purchase a pH meter and an EC or CF meter - VERY IMPORTANT! - in order to be able to accurately measure the concentrate of your nutrients so as to avoid over or under feeding.